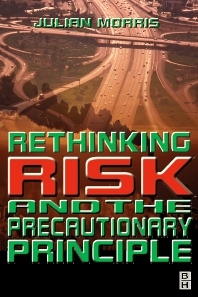 Rethinking Risk and the Precautionary Principle challenges the claim that the precautionary principle is an appropriate guide to public policy decision-making in the face of uncertainty. The precautionary principle is frequently invoked as a justification for regulating human activities. From bans on the use of growth hormones in cattle to restrictions on children's playground activities, precautionary thinking seems to be taking over our lives. As the contributors to this book show, such an approach is of dubious utility and may even be counterproductive. This is a timely and important contribution to the debate on how to manage risk in the modern world. The editor, Julian Morris, is Director of the Environment and Technology Programme at the Institute of Economic Affairs in London. He has written widely on issues relating to environmental protection and technological development.